Our engineers, surveyors and fire safety consultants have the expertise and experience to provide you with the best possible service and advice when choosing your firefighting equipment. From initial surveys to installing new extinguishers, we can offer you the correct solution for your premises. If you already have fire equipment fitted then we can service this for you as well. Please contact us to find out more about the equipment and services we can offer you. Annual inspection, installation, commissioning, servicing and test discharging of fire extinguishers should be carried out by a competent person. All our extinguishers are installed in accordance with the current standard of BS 5306, and all units have a warranty of 12 months, or five years if we carry out the annual service. All extinguishers are kite marked BS/EN3 and have CE approval. 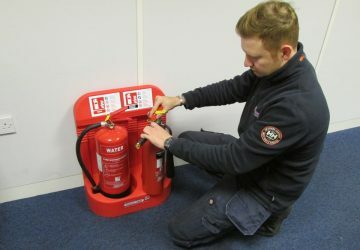 All our engineers are BAFE registered to provide advice on the suitability and positioning of extinguishers and to carry out maintenance and periodic servicing in line with British Standards.